The controversies which grew out of what is known in Pennsylvania history as the Connecticut claim, enter so largely into the early history of this county that no account of its settlement can be fairly understood without a knowledge of how that claim originated, the conflicts involved in its prosecution, and the means by which it was terminated. These controversies related to two distinct questions, the right of jurisdiction and the right of soil. The political conflicts which had been waged in Great Britain, made prominent the distinction between the power to make and execute law and the right of ownership in the soil. This distinction, so fundamental to the English system of government, her colonists brought with them to this country. Soon after the discovery of the New World by Columbus, the different maritime nations of Europe sent out expeditions of discovery, and each claimed jurisdiction over that part of the country explored by navigators sailing under its own flag. Accordingly, the French established themselves along the borders of the St. Lawrence and the great lakes, in virtue of the discoveries of Verranzi and Cartier. The Dutch laid claim to the territory bordering the Hudson, which had been explored by Henry Hudson. The English claimed jurisdiction of that part of the continent extending from the St. Lawrence to Florida, and from the Atlantic to the South sea, as the Pacific ocean was then called, in consequence of the discoveries of the Cabots and others sailing under the patronage of the King of England. For the purpose of extending and maintaining the authority of the British crown over the immense territory to which it laid claim, great companies, composed of noblemen, merchants, and wealthy gentlemen, were incorporated by James I., king of England, in 1606, by letters-patent under the name of the London and Plymouth companies. To the former of these was granted the territory of South Virginia, extending from the thirty-fourth to the fortieth degree of north latitude, and from the Atlantic ocean on the east to the South sea on the west; to the latter company the territory of North Virginia or New England. On November 3, 1620, the Plymouth company was incorporated by letters patent under the name of the Great Council of Plymouth, and these was granted to them, their successors and assigns, all of New England in America, in breadth from the fortieth to the forty-eighth degree of north latitude, and in length within all the breadth aforesaid, throughout the mainland from sea to sea, "provided always that any part of the premises hereinbefore mentioned, and by these presents intended to be granted, be not actually possessed or inhabited by any other Christian prince or state." To this company were granted both the jurisdiction and the royal pre-emption of the soil, with the authority to distribute their territory and assign their prerogatives to companies of adventurers, for the purpose of occupation and settlement. Accordingly, in 1628, the grant of Massachusetts was made by the Plymouth council, in breadth from the Merrimack to the Charles river, and in length throughout all the breadth aforesaid north and south, from the Atlantic on the east part of the South sea on the west part. This grant, which extends southward, as the lines were settled, to the forty-second degree of latitude, was, with the proviso in the great Plymouth charter, confirmed by King Charles I., in 1629. In 1630 the Earl of Warwick, president of the Plymouth council, procured a grant of a certain large tract of land from the said council, and the same year obtained the king’s charter of confirmation. This he conveyed to Lords Say, Seal, Brooks, Humphrey, Wyllys, Saltonstall, and others, twelve in number, by deed dated March 19, 1631. This grant included all that part of New England in America extending from a river called Narragansett river the space of one hundred and twenty miles as the sea-coast lieth toward Virginia, and in length within the breadth aforesaid throughout all the mainlands from the Western ocean to the South sea. The territory, as thus described, includes a belt of land bounded on the north by the south line of the Massachusetts grant, and on the west by the Pacific ocean. The forty-first parallel enters the State of Pennsylvania at Stroudsburg, and passes near Bloomsburg, Clearfield, and New Castle. That part of Pennsylvania north of this line was embraced in the Connecticut claim. The company of Lord Say and others appointed John Winthrop their agent, who entered upon and took possession, and made a settlement at mouth of Connecticut river, to which he gave the same of Saybrook, in honor to his principal patrons. While the right of soil and privileges pertaining to it might be transferred from one to another, the right to from a separate government was deemed so sacred that it must emanate directly from the crown in each particular instance in which it could be legitimately exercised. The great Plymouth council having apportioned out to adventurers all the lands comprised within their grant, in order that the king might confer upon these several companies charters containing the powers and privileges of government, in the year 1635 released their right of jurisdiction to the crown in nearly the same descriptive words as are contained in their grant, mentioning their western extension to be considered about three thousand miles. A number of English colonists who had emigrated from the Massachusetts plantations and settled upon the Connecticut river, finding they were without the Massachusetts patent, formed themselves into a voluntary association, took upon themselves the name of the Colony of Connecticut, adopted a plan of government, and purchased of George Fenwyck, Esq., then agent of Lord Say and others, all their lordships right derived from the grant of Plymouth council. In the year 1661 they petitioned King Charles II, setting forth their colonization, their grant from Lord Say and company, their acquisitions by purchase and conquest, praying him to grant them a charter of government agreeable to the system they had adopted, and to confirm the grant they had obtained of the assigns of the Plymouth council. In consequence of this petition, His Majesty granted them a charter dated April 20, 1662, in which he "ordained, constituted, and declared John Winthrop and others, his associates, a body corporate and politic, by the name of the governor and company of the English colony of Connecticut, in the New England, in America." This charter covered all the territory included in the grant to the Earl of Warwick, with the usual proviso, excepting any part of the said territory which might be inhabited or possessed by any other Christian prince. By this charter the two colonies or jurisdictions of Connecticut and New Haven were united. The States General of Holland granted to some adventurers a charter, in 1614, under which settlements were made on the western end of Long Island and along the banks of the Hudson as far as Albany. Negotiations were entered into by the governor of Connecticut and the Dutch governor for establishing the boundary line between the two colonies. A provisional line was run and agreed upon, subject to the ratification of the respective governments. In the meanwhile Charles II granted to his royal brother, the Duke of York, the territory covered by the Dutch patent, who, in August, 1664, dispossessed the Dutch and assumed the government of the territory. Negotiations were begun afresh for settling the eastern bounds of the Duke’s patent, which were at length determined by a royal commission, agreed to by the respective governments and confirmed by the royal mandate in 1730. The west line of the duke’s patent was the Delaware, and was never a matter of dispute between the two governments of New York and Connecticut; the latter colony never relinquished her claim to the territory west of the Delaware and within the bounds of her charter. Under the date of Sept. 14, 1720, Governor Saltonstall, in reply to certain questions of the Board of Trade, says, "On the west province of New York have carried their claim and government quite through this colony from south to north and cutt us asunder, twenty miles east of Hudson’s river." This language is inexplicable on the theory that the determination of the eastern boundary of New York was considered as marking the western bounds of Connecticut. For a number of years this claim of Connecticut was in a measure acknowledged both by the home government of Great Britain and by the colonial governments in America. In 1752 or 1753 commissioners were appointed to settle the disputes which had arisen between England and France with reference to their possessions in North America, on the basis that each crown was to hold the lands most anciently granted to its subjects. The English commissioners produced the charter to Plymouth council and the grants under it of Massachusetts Bay and Connecticut, which were some years earlier than any grants made by the French king. To this the French commissioners replied, " You claim the whole country; there is no settlement to make," and the negotiations were broken off. In 1754 a congress composed of deputies from the British colonies north of Virginia, held at Albany by direction of Lords of Trade and Plantations, declare, "The ancient colonies of Massachusetts Bay and Connecticut were, by their respective charters, made to extend to the South sea." In 1755 the governor of Pennsylvania spent a whole session in a dispute with the assembly relative to the jurisdiction of Fort Du Quesne, the governor affirming that it was within the province of Pennsylvania, and the assembly declaring that it was within the colony of Connecticut. King Charles II, of England, by his letters-patent, dated Feb. 28, 1681, granted to William Penn, his heirs and assigns, all that tract of land in America bounded on the east by the Delaware River, on the north by the beginning of the three and fortieth degree of northerly latitude, on the south by a circle drawn twelve miles distant from New Castle town northward and westward to the beginning of the fortieth degree of northerly latitude, thence by the beginning of the said fortieth degree of northerly latitude, to extend westward through five degrees of longitude to be reckoned from the said easterly bounds. This grant encroached on the south upon the previous grants to Lord Baltimore and the Virginia colony, giving rise to controversies which were adjusted by compromises, and long and expensive lawsuits; it also lapped upon the previous grant to Connecticut the width of about one degree of latitude, extending the whole length of Pennsylvania, giving rise to controversies which were not adjusted until more than one hundred and twenty-five years after. While the royal charters conveyed to the grantees lands, rivers, mines, minerals, all and singular other commodities, jurisdictions, royalties, privileges, franchises, and pre-eminences, it was nevertheless the doctrine held by Connecticut, as well as by Pennsylvania, that these chartered rights were subject to the prior claim of the native inhabitants, and that the Indian title must be extinguished by either purchase or conquest before the land could be lawfully entered upon by the English colonist. It will be remembered that the New York Iroquois claimed jurisdiction over all the northern part of Pennsylvania. Holding their lands in joint tenancy, all sales were required to be negotiated at public treaties, at which all had a voice in the deliberations and shared in the price and the presents. As the question of Indian purchase entered largely into the controversies relating to the right of soil in the disputed claim, it will be necessary to trace this subject with some degree of minuteness. The authority to make purchases of land from the Indians was implied in the royal charters, and resided in the grantees within their charter limits. In Pennsylvania this right inhered in William Penn and his heirs, or in agents appointed and authorized by them. But in Connecticut every freeman was a proprietor, and the right of purchase was regulated by the assembly. Until 1717 every freeman was permitted to make purchases of the Indians. It was then enacted that "no title to any lands in this colony can accrue by any purchase made of the Indians, on pretense of their being native proprietors thereof, without the allowance or approbation of this assembly." To nearly all the territory within the present limits of that State the Indian titles were extinguished by individuals, or by companies acting on their own discretion and responsibility. This fact of the purchase being shown, upon their petition they were incorporated into a town and entitled to representation in the assembly. Lots were surveyed and assigned to the members of the company according to regulations adopted among themselves. It will thus be seen that the methods of making Indian purchases and effecting settlements in Connecticut and Pennsylvania were radically different. In the former, it was by voluntary associations of the freemen, acting with the authority and consent of the assembly; in the latter, solely by the lord proprietor or his agents. Keeping these facts in mind will enable the reader to understand the reason for the procedure of the parties to t his controversy and will answer some of the objections which each made to the transactions of the other. As early as October, 1736, the Six Nations, at a public treaty, entered into a solemn contract with the Proprietaries of Pennsylvania, in which they engage for themselves and their posterity, "that neither we, nor any in authority in our nations, will at any time bargain, sell, grant, or by any means make over, to any person or persons whatsoever, whether white men or Indians, other than to the said proprietors, the children of William Penn, or to persons by them authorized and appointed to agree for and receive the same, any lands within the limits of government of Pennsylvania as it is bounded northward by the government of New York and Albany." This was the famous deed of pre-emption of which so much was said in the discussions on Indian title. At the treat of Albany this deed was indorsed, confirmed, and ratified by the chiefs of the Six Nations, July 9, 1754. The territory of Connecticut, east of New York, being nearly all taken up, many of the people began to turn their eyes toward some favorable location, within her chartered limits, to the westward. Rumors of the wondrous beauty and fertility of the Susquehanna valley were in circulation. A few prominent men of Connecticut, wishing to know more of the country, sent a party to explore this region. They were charmed with Wyoming. Its broad plains, its rich soil, and beautiful situation made it a paradise beside the sterile, rock-bound New England; and so favorable a report did they make, that an association, styled the Susquehanna company. As the Susquehanna company played so prominent a part in the land controversies of this county for nearly half a century, and as a greater part of the first settlers here came under its auspices, and held their lands under its title, a brief account of the history of its operations may be of interest. Following the usual plan adopted in Connecticut for acquiring the Indian title, and settling the unappropriated lands of the colony, it was voluntary association of Connecticut freemen, organized under the laws of the colony. At a meeting of the company, held in September, there were 350 members enrolled; by the next January the number had increased to 500. Rules were adopted for the admission of new members, which at length numbered above 1200, embracing many prominent men in every New England colony, in the provinces of New York and New Jersey, even in Pennsylvania and in Great Britain. Each member was a joint owner in the territory and was called a proprietor. The congress at Albany, in 1754, having been summoned, among other things, for the purpose of effecting purchases of land from the Indians, a meeting of the company was held on the 9th of January, and Deacon Timothy Woodbridge, of Stockbridge, who was deeply interested in Wheelock’s Indian school, and had the year before accompanied Rev. Gideon Hawley on a missionary tour among the Indians**, was appointed to negotiate a purchase of Susquehanna land for the company. By the aid of Colonel John H. Lydius, of Albany, a deed was obtained from the Indians, for the company, of a large tract of land beginning ten miles east of the East Branch of the Susquehanna river, and on the one-and-fortieth degree of north latitude, thence with a northward line ten miles distant from the said river to the end of the forty second degree, and to extend westward throughout the whole breadth thereof, through two degrees of longitude, one hundred and twenty miles. This deed, which covers all of Bradford County, except the northeastern corner, was properly executed, and signed by seventeen sachems of the Six Nations, and bears date July 11, 1754.
at the council board, and sustained his station with reputations." Doc. Hist. Of N.Y., iii. Another association, called the "Delaware Company," was subsequently formed. A deed to Hezekiah Huntington and three hundred and sixty others, his associates, was obtained from the "Ninnepuncs or Delaware Indians," of a tract extending through the breadth of the Connecticut charter, from the Delaware River on the east to the line of the Susquehanna company’s purchase on the west. This included the northeastern part of Bradford County, comprising the township of Warren, with parts of Windham, Orwell, and Pike. This territory they surveyed into townships of six miles square; appointed Elisha Hyde, of Norwich, Conn., their agent to negotiate the sale of townships to companies of settlers; Andrew Tracy, Oliver Crary, Robert Gere (2d), and William Young Jr., a committee to grant townships for the company. Of the two townships which were in Bradford county, Martel was granted October 14, 1795, to Elisha Hyde "to defray his expenses as agent," and Minden, April 25, 1796, to Elisha Hyde and Elisha Tracy, both of Norwich. These parties sold to the settlers, the details of which will be given in the annals of Warren and Orwell. The Delaware company was not a conspicuous party to the land controversies in this county, only so far as their interests were blended with those of the Susquehanna company. The Susquehanna company at once began to take measures for occupying their lands, and in the fall of 1754 a considerable number came on for the purpose of selecting a favorable location for a settlement, but on account of the disturbed condition of affairs, growing out of the French war, the matter was held in abeyance for eight years. Peace having been declared, the company at once renewed its efforts to take possession of its domain. For the encouragement of settlers, two townships, each ten miles square, were granted as a gratuity to the first two hundred, they being proprietors, provided they begin their settlement before November 1, 1762. Accordingly, a large party was sent on the last day of August, who built houses and fences, made hay, and such other preparations as were deemed advisable for the reception of the colony the following spring. For the additional security of their settlers, the company appointed a committee to attend another treaty with the Indians, held at Albany in March, 1763, at which the Indians confirmed their former sale, and guaranteed to the company immediate and peaceable possession of the land. In the month of May following, about one hundred and fifty settlers came on, some of them bringing their families with them, and occupied and improved lands in Wilkes-Barre, Kingston, Plymouth, and Hanover. This year the Pontiac war broke out, and bands of hostile Indians began to hover over the frontier settlements in Pennsylvania, watching for a favorable opportunity to avenge the wrongs inflicted upon them by the whites. Zeisberger had been recalled from Wyalusing, and on his way to Bethlehem stopped among the New England people, and warned them of their danger; but was informed that they intended to remain and hold their land at all hazards, and did not consider the danger as great as it was represented. About midday, on October 15, just as they were returning from their fields, the settlers were suddenly attacked by a band of hostile Indians; twenty of their number were killed, a few were taken prisoners, and the remainder fled, leaving everything behind them. By orders of the crown, all further attempts at making a settlement on the Susquehanna were suspended until the establishment of peace. This was finally secured at the treaty of Fort Stanwix, in November, 1768, at which time the Proprietaries of Pennsylvania effected a purchase of a tract of land, beginning at Owego, thence following the left bank of the Susquehanna as far as the mouth of the Towanda creek, thence up the Towanda, along the Burnett hills, down Pine creek to the West Branch, and across to the Ohio. This tract included a large part of Bradford County. The remaining part of the territory was not purchased until after the close of the Revolutionary War. The Pennsylvania government, now holding a title for the coveted Wyoming, at once adopted vigorous measures to effect a settlement under the patronage of the Proprietaries, for whom two large manors were surveyed, and lots of one hundred acres each were leased to Charles Stewart, Amos Ogden, and others, friends to the Proprietaries, at a nominal rental, on condition that they hold possession of the country. Within a short time, warrants were issued and surveys were made of the most valuable lands in the purchase, which were assigned to the friends of the government, to be held by themselves or leased to their faithful allies. In the meanwhile the Susquehanna company were not idle. Learning that the Indians had finally released all claims to the Susquehanna lands, a meeting of the company was held at Hartford, Dec. 28, 1768, at which the former grants were rescinded, and five townships, each five miles square, were offered as a gratuity to the first two hundred and forty settlers, they being proprietors, or their agents; to the first forty should be given the choice of these townships. The others should be divided into fifty-three equal parts, of which fifty should be allotted to the settlers, and the remaining three reserved for the support of the gospel ministry and of schools in each of said townships,-"the aforesaid townships to be held by the said forty and the said two hundred, on consideration of their entering upon and taking possession according to the above vote, and also of their continuing thereon, holding and improving the same, by themselves, heirs, or assigns, under said company, for the space of five years after their entry as aforesaid." As the movements of the Susquehanna company from this time begin to be conspicuous in the settlement and history of northern Pennsylvania, a brief account of its rules and policy, with regard to its settlers and settlements, as developed by the resolves of its meetings, may be of interest. Proprietors of the said township shall hold the same." At another meeting of the company, held in Windham, March 9, 1774, the time in which the twenty settlers must be located in the township was extended to three years after the grant was made, "on account of troubles now existing in the purchase." The year before it was ordered that each whole share proprietor should have liberty to take up to fifty-third parts of a township, and each half share proprietor one. At a meeting of the company, held in Athens, Pa., Feb. 20, 1795, in order to still further interest settlers and supporters of the company in its desperate conflict with the Pennsylvania authorities, each township was divided into sixteen equal parts of one thousand acres each, of which each whole share proprietor could take two, and each half share proprietor one. A proprietor was allowed to locate a right and make a settlement on any of the unoccupied and ungranted land of the purchase. Such locations were called Pitches, and on the survey and allotment of the township in which they were situated were to be assigned as part of the occupant’s right or share. When the company was organized any freeman could become a member of it by paying the sum of two dollars. Such flattering reports of the purchase were brought back that multitudes sought to be admitted to the company, who permitted a limited number to be incorporated by the payment of sums which varied from two to fifteen dollars. The rights thus acquired were called proprietors’ or "original rights." should go upon the ground and hold their possessions for a certain number of years. These were called "settling rights." Many of the Connecticut settlers suffered losses in various ways in their conflict with the Pennsylvania authorities in supporting the claims of the company. These losses were usually compensated by additional grants of land, which were known as "suffering rights." Many proprietors, who did not become actual settlers, received certificates for their rights. Also, for purposes of revenue, rights were sometimes ordered to be sold to the highest bidder. These certificates often floated about as a species of currency or as sources of speculation, under the name of "certificate rights." At a meeting of the company, held at Hartford, July 13, 1785, it was "voted that every able-bodied and effective man, approved by any one the company’s committee, not being a proprietor, and that will repair to Wyoming, submit himself to the orders of this company or their committee at that place, shall become a ‘half-share’ man proprietor in said company, entitled to all the benefits of any proprietor thereof that has paid his full taxes to this time, provided he remains in said country for the space of three years, and do not depart therefrom without the permission of such committee; also provided that such half-share proprietors do not exceed four hundred, and provided they arrive by the first day of October, next." To such as complied with these conditions certificates were issued, which were known as "half-share rights." At first, the company made no provision for civil government among its settlers. They lived without courts and without constables. A few simple rules were adopted by conventions of the settlers, which, without the forms, were observed as the laws of the settlements. This pure form of democracy continued for more than five years, the company expecting , either that they would be incorporated as a town by the assembly of Connecticut, or constituted into a separate government by royal charter. At a meeting held at Hartford, June 2, 1773, after recounting in brief their history and claim, professing loyalty to the king, and obedience to law, they direct that three directors shall be chosen in each township, "who shall be able and judicious men, to take upon them, under the general directions of this company, the direction of the settlement of each such town, and the well-ordering and governing of the same, to suppress vice of every kind, preserve the peace of God and the king therein, to whom each inhabitant shall pay such and the same submission as is paid to the civil authority in the several towns of this colony." Elections were to be held each year for choosing directors and a constable or peace officer. Appeals from the decision of the directors of a township could be taken to quarterly meetings of all the directors. This simple system of jurisprudence adopted by the company continued in force until the incorporation of the town of Westmoreland, when the laws of Connecticut were put in full force by officers legally chosen. Among the directors first appointed were Obadiah Gore, Jr., for Wilkes-Barre, Gideon Baldwin for Providence, Captain Obadiah Gore and Parshall Terry for Kingston. These, except Captain Gore, were subsequently residents of Bradford County. With this brief account of the polity of the Susquehanna company, given to enable the reader to understand terms and allusions which will frequently occur in the succeeding pages of this chapter, we will now return to the movement of both parties to obtain and secure possession of the Wyoming valley. In February, 1769, the first forty, sent out in pursuance of the Susquehanna company’s vote of the previous December, arrived at Wyoming, where they found the Pennsylvania party, under Stewart and Ogden, in possession of their houses on Mill creek. Of the captures, reprisals, breaches of faith, and bloodshed, known as the first Pennamite war, whose theatre was Wyoming, it is not proposed to speak. So far as any of our people were connected with them will be mentioned in the personal sketches, which will be given in the township annals. The years of 1772, ’73, and ‘74 were a period of peace and prosperity for Wyoming, and emigrants poured in rapidly upon the new settlements, which extended through the valley, up the Lackawanna, and up the Susquehanna as far as Tunkhannock. As new settlers continued to arrive, their attention was directed to the fertile valleys and Indian clearings in this county, and grants for new townships were applied for. Accordingly, Samuel Gordon, who had recently been commissioned surveyor by the Connecticut assembly, surveyed for David Smith the township of Standing Stone, in the early part of 1774, and for James Wells and others what they called the "Long Township," extending south from Standing Stone thirty miles down the river. For some reason, probably for want of the requisite number of settlers, the grant of the former township was never perfected, and, although the oldest of the Susquehanna company’s townships in this county, was excluded from the privileges of the compromises. The Long township survey, not being according to the company’s rules, was given up, and Springfield and Braintrim substituted for it. But the troubles that led to the Revolution, by which the colonies were forever separated from the jurisdiction of Great Britain, arising about this time, the commission was never appointed. The same year (1774) Connecticut formally assumed jurisdiction over the disputed territory, by organizing the town of Westmoreland and attaching it to the county of Litchfield. The county of Westmoreland was constituted October, 1776, by an act of the Connecticut legislature, in which it was provided that it should "have and exercise the same powers, privileges, and authorities, and be subject to the same regulations as the other counties in this State by law have and are entitled to." Henceforward members were regularly sent from Westmoreland to the Connecticut assembly. Soldiers enlisted there for the Revolutionary war were credited to the Connecticut line, and the jurisdiction and laws of that State were in as full force over the Wyoming settlements as over any part of the State. In accordance with a resolution of Congress, passed in 1775, both parties refrained from further violent measures until the question of jurisdiction should be adjudicated by a competent tribunal. In November, 1779, the assembly of Pennsylvania passed an act assuming to itself the jurisdiction over the entire territory granted to William Penn. By this act the commonwealth became a party to the controversy, which by these several acts became clearly a question of jurisdiction between the States of Connecticut and Pennsylvania. Article IX. of the articles of confederation provided for the appointment of special commissions to determine all disputes and differences arising between two or more States concerning boundary or jurisdiction; also all controversies concerning the private right of soil claimed under different grants of two or more States. The supreme executive council petitioned congress, November 3, 1781, stating the matter in dispute between the two States, and praying for a court to be constituted, according to the provisions of Article IX., to hear and issue the case. On the 12th of August, 1782, it was announced that commissioners had been mutually agreed upon by the delegates of the respective States. Each party having been duly notified, the court commenced its session at Trenton, November 12, 1782. That North America being discovered by Cabot, in the years 1594 and 1596, the crown of England assumed the right of granting the property and jurisdiction thereof to its subjects by letters-patent. That in the year 1664 the crown granted all the land between the west side of the Connecticut river and the east side of Delaware bay to the Duke of York, and shortly after promised to Sir William Penn, in reward for his services, a large tract of land westward of the duke’s patent; but Sir Williams dying, the grant was made to his son in consideration of his father’s services and in consideration of debts due from the crown to Sir William’s estate. unto the 43d degree of northern latitude. That this grant was long depending before the council, considered with more attention and caution than usual, and, after hearing all objections that could be made to it, passed, and was immediately published with an account of the province of William Penn, the proprietor. That to prevent any claim which might be made by the Duke of York, Mr. Penn obtained a release from that nobleman. no more than the right of pre-emption), the then proprietor and his successors purchased the land from the natives for valuable considerations, and in this legal and equitable manner obtained a just and complete title to all the lands within the bounds of the province. Pennsylvania charter) the Indians sold the right of pre-emption to the proprietors, and covenanted to sell the lands to none but them, their heirs and assigns. That in 1754 a second deed of the same kind was made, and the former deed was recognized. That actual settlements were made northward of the 41st degree of latitude by the subjects of Pennsylvania, long before any claim or settlements of those lands were made by Connecticut. That by an act of Assembly of Pennsylvania passed on the 27th day of November, 1779, the estate of the Proprietaries vested in the commonwealth of Pennsylvania. England), Connecticut affirms also the first point offered by Pennsylvania. made by the crown by letters-patent dated November 3, 1620.
by letters-patent bearing date April 23, 1662 ( more than nineteen years previous to the grant made to William Penn). arbitrarily resume it at pleasure. proviso inserted in all the ancient charters. of her claim to lands west of the Delaware and within her charter boundaries, but to limit the duke’s claim eastward. purchase a large tract of land west of the Delaware, of the natives, at Albany, in 1754.
not making any open objection thereto. and others, acknowledging and confirming the grant made in 1754, and giving possession of the land. Pennsylvania from the natives of the same land. That Connecticut had made possessions upon the lands in dispute as early as 1762, and is now in possession of them. The proofs having been offered, and the various points argued, the court, after passing a resolution to give no reasons for their decision, and that the minority should agree to make the judgment unanimous, published, December 30, 1782, the following decision: "We are unanimously of opinion that Connecticut has no right to the lands in controversy. We are unanimously of opinion that the jurisdiction and pre-emption of all territory lying within the charter of Pennsylvania, and now claimed by the State of Connecticut, do of right belong to the State of Pennsylvania." To this decision of the simple question of jurisdiction between the two States, the only question before the court, all parties professed a ready acquiescence. Connecticut immediately ceased from, and Pennsylvania assumed control of this grand domain, while the settlers declared their entire willingness to yield obedience to all constitutional laws enacted by the commonwealth, and united in a petition to the legislature for the enactment of a law to quiet them in their possessions, and establish civil government over them. Early Map of Bradford County CA 1775 which only covered the areas close to the river. There were other questions, however, which were still undecided. 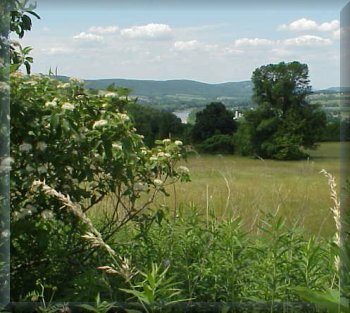 It will be remembered that the Proprietary government made grants of the most valuable tracts of land along the Susquehanna company, immediately after the Indian purchase of 1768, while these same lands had been appropriated by the Susquehanna company among its proprietors. The act of 1779, vesting the charter rights of the heirs and devisees of William Penn in the commonwealth, confirmed the grants made by the Proprietaries, or their agents, prior to July 4, 1776, and placed the disposal of the remainder of the lands, except what had been taken by the Proprietaries as their individual property, within the charter limits of the State, into the hands of the legislature. Between the rival claimants-those holding under title derived from Pennsylvania and those holding under the Susquehanna company, commonly called Connecticut titles-was waged a long and bitter contest. Of all possessions that of real estate is deemed the most sacred, the transfers of it attended with the most rigid formalities, and claim to it enforced with the most unyielding pertinacity by the great masses of men. This was as true in the earlier history of the country as at the present. It is not, therefore, surprising that the question of the ownership of so large and valuable a section of the commonwealth should have been pursued with a vigorous and uncompromising spirit to the very last. The Pennsylvania legislature, on the recommendation of the Trenton court, and on the petition of the Wyoming settlers, sent a commission to make inquiries into the state of affairs, hold elections for justices of the peace, and do other acts necessary for the establishment of civil government over the disputed territory. The acts of this commission, though unauthorized by the law under which they were appointed, were subsequently approved by the legislature. To this commission both the Connecticut settlers and those holding Pennsylvania titles appealed, and were informed that considerations of public policy would require the State to protect the claims of those who held lands under titles derived from her authority. The justices, who were Pennsylvania land holders, proceeded to reinstate their friends, and to treat the Connecticut settlers as a band of lawless intruders. The settlers resisted this summary method of disposing of their claim. They declared that the Trenton court did not decide the question of the right of the soil, which was distinct from the question of jurisdiction; that they had acquired a good title to the lands of which they were in possession, under the laws of Connecticut, which, for a number of years, had exercised unopposed jurisdiction over the territory; that heretofore when new boundary lines had changed the jurisdiction of a territory, as between New York and Connecticut, or between Pennsylvania and Maryland and Virginia, land in possession under the grant of one State was confirmed to the possessor by the State under whose jurisdiction the disputed territory was decided to belong. The Pennsylvania party urged that the same land had been lawfully acquired by them, that they were also in possession; that the decree of Trenton did not change the jurisdiction from Connecticut to Pennsylvania, but affirmed that the jurisdiction and right of pre-emption had always belonged to the latter, and, therefore, that all Connecticut grants were without right and void. But these questions were altogether too nice for Justice Patterson to spend much time in discussing. He was a Pennsylvania justice and a Pennsylvania land-holder. He must be protected, and the Yankees driven out at all hazards. Finding that arrests and threats could not intimidate his rival claimants, upon his representations two companies of Pennsylvania militia were stationed at Wyoming, ostensibly to protect the inhabitants, but really to oppress the Connecticut people. For nearly three years the Wyoming settlements were in a state of confusion and strife more bitter and disastrous than the first Pennamite war. Between the settlers and the Pennsylvania authorities, acting in the interest o the land-holders, the conflict was waged with great acrimony, involving the shedding of blood and the loss of life. Many, to escape the strife, moved into this county, where comparative peace prevailed. In a letter to President Dickinson, dated April 29, 1784, Patterson writes, "Upon my arrival at this place (Wyoming), the 15th inst., I found the people for the most part disposed to give up their pretensions to the lands claimed under Connecticut. Having a pretty general agency from the land-holders of Pennsylvania, I have availed myself of this period, and have possessed in behalf of my constituents the chief part of all the lands occupied by the above claimants. Numbers of them are going up the river to settle. In this I give every encouragement in my power, and take care to fill up their vacancy with well-disposed Pennsylvanians." The conduct of Patterson and his troops towards the New England people was an outrage upon all law, decency, and humanity, while that of the legislature was fickle and vacillating. On the instance of the petitions of the Wyoming people, and reports of commissions sustained by depositions recounting the cruelty of those acting under the authority of the State, the legislature would pass laws one session for the protection of the settlers, only to be repealed the next under the influence of the land-holders, until, wearied by the conflict and worn with the suffering, the settlers dispaired of any relief from the legislature or officials of Pensylvania. The Susquehanna company, which had intermitted its meetings during the Revolutionary war, and seemed paralyzed by the Decree of Trenton, was aroused to new life through the efforts of Col. Franklin and by the sufferings of the Wyoming people. A meeting was held in Hartford, July 13, 1785, at which the company resolved to support its claim to its purchase, to protect its settlers, to grant four hundred half-share rights, then equivalent to three hundred acres, to settlers who should go and remain on the land for three years, and sell six hundred full shares or rights for the use of the company in defending their claim. This was the beginning of that speculation in Susquehanna lands which ultimately proved so disastrous to many who were engaged in it, and let to the distinction between "old setters"-that is, those who had purchased in good faith for the purpose of settlement-and the "half-share men," wild Yankees, who were mere speculators, adventurers of all sorts, who came taking the risk of making or losing on the issue of controversy. As this distinction was subsequently made prominent, attention is called to its origin. By this time all New England was ringing with the story of Yankee sufferings and Pennsylvania oppressions. Wyoming, her sacrifices and her heroism, the Indian massacre, Patterson’s brutality, land holders’ rapacity and the soldiers’ lawlessness were themes familiar in every household, and hundred were ready to rush to the succor of their suffering friends. Agent of the Susquehanna company were sent through New England and eastern New York, who sold rights and townships, gathered recruits for the conflict and settlers for the purchase. Says Col. Franklin, in his account of this period, "In the month of November the settlers got to be numerous. A meeting was called; about four hundred were present. A regiment was formed and officers appointed. A form of government was also established by the authority of the people, to remain in force until law could be established on constitutional principles. A committee of directors was also appointed to regulate the affairs of the settlement, agreeable to the form adopted. Upwards of four hundred subscribed their names to support the committee or directors in the execution of the important trusts committed to them." In April, 1786, Gen. Ethan Allen, of Fort Ticonderoga celebrity, visited the valley, and proposed to settle on the purchase and bring with him a number of his Green Mountain boys to aid the settlers in maintaining their claim. A large number of rights, and the township of Allensburg, located on the Wyalusing creek, a tract about three miles wide by eight in length, were given to aid the project. The Susquehanna company was stimulated to renewed efforts by the hearty response with which its appeals were met. At the formation of the company it was contemplated to erect its purchase into a separate colony; now it was determined, as the only means of securing the claims of the company, to form a new State out of the contested territory in defiance of Pennsylvania. Prominent men in New England lent their influence to the scheme. A constitution was drafted and approved by the company. It is said that Gen. Allen boasted that with his Green Mountain boys he had made one State and could make another. Nor was sympathy for the settlers wanting in Pennsylvania. Many prominent men throughout the State were loud in their denunciations of the odious legislation and the tyrannical acts of the authorities. They declared the measure instituted against the Connecticut people to be a disgrace to a free and Christian State; that the interests of a score of men in a few acres of land were allowed to blacken the good name of the commonwealth and imperil the public peace. The legislature, though moved neither by appeals for justice or mercy from the settlers, could not be deaf to the voice of censure raised within as well as without the State, and appalled by the danger of which not threatened the integrity of the commonwealth, at once began to adopt measures of conciliation. The first movement in this direction was an act, passed September 25, 1786, erecting the county of Luzerne out of the northern part of Northumberland, with the following boundaries: Beginning at the mouth of Nesopeck creek and running along the south bank thereof eastward to the head of said creek, thence a due east course to the head branch of Lehigh creek, thence along the east bank of Lehigh creek to the head thereof, thence a due north course to the northern boundary of the State, thence along the said boundary line to a point fifteen miles west of the east branch of the Susquehanna river, thence a straight line to the head of Towanda creek, thence along the divide of the waters of the two branches of the Susquehanna to a point due west from the mouth of Nesopeck creek, thence to the place of beginning. This included the present counties of Luzerne, Wyoming, Susquehanna, and Bradford, except a triangle in the northwestern part of the latter, which remained attached to Northumberland. Col. Timothy Pickering, a native of Massachusetts, who had been quartermaster-general during the Revolutionary War, and held in high esteem throughout the country, a man of consummate skill and great ability, was appointed to organize the new county and endeavor to quiet the Wyoming disturbances. Promises were freely made that the settlers should be quieted in their possessions if the laws of Pennsylvania were allowed to be put in operation. At the suggestion of Col. Pickering, a petition setting forth that seventeen townships, each five miles square, in which lots, averaging three hundred acres each, had been specifically set off to settlers by the Susquehanna company, previous to the Trenton Decree, and praying that these might be confirmed to the present owners, was signed by a large number of the old settlers and forwarded to the legislature; whereupon the assembly, March 28, 1787, passed what was called the confirming law, in which it was provided "that all rights or lots lying within the county of Luzerne, which were occupied or acquired by Connecticut claimants who were actual settlers there at or before termination of the claim of the State of Connecticut by the decree aforesaid, and which rights or lots were particularly assigned to the said settlers prior to the said decree, agreeably to the regulations then in force among them, be and they are hereby confirmed to them, their heirs and assigns." Provision was also made for compensating the Pennsylvania claimants out of the unappropriated lands of the commonwealth, for the appointment of commissioners, the exhibition of claims, and whatever appeared to be necessary to carry into effect the provisions of the law. While the objects contemplated in this act were not effected by it, the law is important because it was the first unqualified acknowledgement on the part of Pennsylvania of the Connecticut claimants, and also because it exhibits the policy of the commonwealth in adjusting the claims of the settlers by making a distinction between the "old settlers," whose titles originated previous to the Trenton decree, and the half share men and others, whose titles were acquired by grants of the Susquehanna company subsequent to July 13, 1785, treating each claimant as an individual whose claim was to be adjusted according to the rules of the company, refusing otherwise to recognize the companies as having any legal existence or any claim, as companies, against the State, and making compensation to the Pennsylvania claimants. 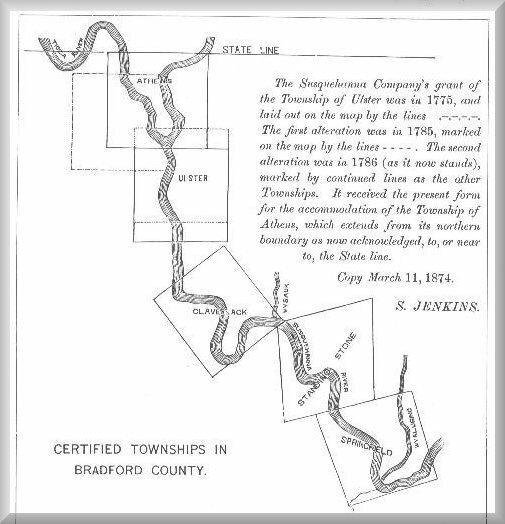 The Susquehanna company had granted four townships within the territory of Bradford County previous to the Trenton decree. The Long township, extending from Standing Stone to Mehoopany, being disapproved by the committee, "upon the application of Anderson Dana, Nathan Kingsley, Amos York, James Wells, and others, their associates, proprietors in the Susquehanna purchase, made to the committee of said company in the year one thousand seven hundred and seventy-seven, praying for a grant of a township, agreeable to the regulations of said company, the said committee, in pursuance thereto, did grant to the said applicants and their associates a certain township of land described in a survey made by Samuel Gordon, October twenty-second, one thousand seven hundred and seventy-seven, bounded as follows: etc., …which said town is known and described on the plan of said purchase as Springfield." This grant is signed by "John Franklin, Elisha Satterlee, and John Jenkins, committee." This township, whose centre was near the mouth of the Wyalusing creek, included the flat lands at Wyalusing, and the Old Misieum on the east side of the river, Quick’s Bend, Sugar Run, and Terrytown on the west side. This township of Standing Stone included the lowlands of Rummerfield, Standing Stone, Frenchtown, and Macedonia, and though granted as early as 1774, for some reason was not confirmed by the committee until many years after, and was not included in the petition for the confirmation of titles. On the 4th of June, 1778, the committee on the petition of Col. John Lydius, Capt. Abraham Lansing, Baltiaser Lydius, and Peter Hogeboom, granted the township of Claverack to Lansing, Hogeboom, and Capt. Solomon Strong. This township embraced Wysaukin, Towanda, Sugar creek, and the Lower Sheshequin flats. The township of Ulster, or Old Ulster, as it was subsequently called, was granted to Asahel Buck, agent for the proprietors, August 28, 1775. This township was located on the west side of the Susquehanna, and covered the flats of Queen Esther and Athens. Owing tot he breaking out of the Revolutionary war soon after, no survey nor allotment of the township was made. This was superseded by a second grant made September 12, 1785, which was also superseded by two grants,-one of Athens, made May 9, 1786, and the other of Ulster, July 23, 1786. The accompanying map shows the location of these several townships. It will be observed that the lines of these townships are so run as to include nearly all the flats along the river, and to avoid, as far as possible, the high and inaccessible hills. The act establishing the county of Luzerne and the confirming law occasioned heated discussions among the Wyoming people. On the one side it was claimed that at length Pennsylvania was disposed to recognize their rights, and securing to them courts, officers, a representation in the legislature, and clear titles to their lands acquired before the Trenton decree, was all that could reasonably be demanded. On the other side, it was urged that no confidence could be placed in Pennsylvania; they had been repeatedly deceived by her promises, and might be again; that the law ignored the right of the Susquehanna company to the soil; that there were many who had expended large sums of money, whose husbands, brothers, or fathers had been slain in the war, who had not been assigned their lands until after the Trenton decree, but whose title ought to be as good as any of the old settlers’; and then the half-share men had come to them in their distress, relied upon their promises, aided them in their conflict with the Pennsylvania authorities, whom now to forsake would be the most wicked treachery. A public meeting was called for the purpose of discussing the provisions of the law, and determining what course the settlers should pursue with reference to it. Says Mr. Miner (p. 411), "So great a gathering had not been known in the valley for years. Matters of the highest moment were to be discussed and decided. Indeed the future fate of Wyoming seemed to rest on their deliberations and the decision of that day. Little less than war or peace appeared to be involved in the issue. All felt the magnitude of the question to be resolved. But Wyoming was not longer united. Discord had reared its snaky crest; malign passions were awakened. Brother met brother, and friend confronted friend, not with the all-hail of hearty good-will, but with beating heart, knit brow, and the frown of anger and defiance. Col. Pickering, sustained by the Butlers, the Hollenbacks, the Nesbits, and the Denisons, appeared as the advocate of law and compromise. Col. Franklin, supported by the Jenkinses, the Spaldings, and the Satterlees, came forth the champion for the Connecticut title." The meeting ended in riot and confusion, although a vote was taken to support the laws and accept the compromise. These measures completely thwarted the plans of Franklin and his party, and the new State scheme was utterly annihilated. Again the whole country was in confusion. It was no longer Yankee against Pennamite, but old settlers against the half-share men. With the exception of perhaps a dozen families, the people of this county were all either half-share men or in their interest. The Satterlees, the Spaldings, the Kingsburys, the Terrys, ardent personal friends of Col. Jenkins and Franklin, were ready to carry into effect every plan for opposing any compromise which did not include the half-share men. Franklin was especially busy. His journal for this period discloses the fact that not a day was he idle, but writing letters, addressing meetings, riding from place to place, persuading the settlers to avoid the commissioners and ignore the law, he was to the utmost fanning the fury of the storm. In the mean time, the commissioners provided by the confirming law to examine the titles of such settlers as might apply, and grant certificates to such as by the law should be confirmed in their possession, met at Wilkes-Barre, and decided upon a number of claims; being threatened with violence, however, they adjourned in the month of August. "The party mentioned in my letter of yesterday, worn out with continual watching and fatigue, had dropped their pursuit, save one, whose name was John Tuttle. He went farther up the river, and informed Captain Rosewell Franklin that a number of the offenders were making their escape up the river. Captain Franklin immediately collected a party of fourteen, and on further information from one or two other persons well attached to government, that the offenders were at a certain time at Standing Stone, on their way up the river, he concluded to lie in wait for them at Wysox creek. The offenders advanced according to the information. But it was expected, as the creek was much swollen with rains, that they would have called to the house on the other side for a canoe, when it was intended that one of Captain Franklin’s party should go over for them, but on his return overset his canoe; and by thus wetting all their arms and ammunition, render the capture of them easy, without hazard of shedding blood on either side. But three of the offenders, Joseph Dudley, Nathan Abbott, and Benjamin Abbott, came first to the creek, and forded it. Captain Franklin ordered them to surrender, when Dudley called out Don’t fire, yet immediately raised his rifle to his face, on which several of Captain Franklin’s men fired, and wounded Dudley and one of the Abbotts. But they all attempted to make their escape. Dudley ran four hundred yards, and dropped, and while Tuttle and another pursued him, the Abbotts did escape. The rest of the offenders took to the woods." Colonel Butler says there were nine in the party who were making their escape. Dudley died from the effects of his would in a few days. The great majority of the half-share men were the sons or other relatives of the old settlers, but were in open sympathy with the party who captured Colonel Pickering, and frankly avowed their hostility to the confirming law, and all other acts of the Pennsylvania government. Pickering, in a letter to Peter Muhlenberg, vice-president of the council, dated Aug. 9, 1778, says, "At this moment great numbers of half-share men are in actual possession of lands allotted to them by Franklin and Jenkins, from Tunkhannock to Tioga and swear vengeance against any who shall attempt to dispossess them of their half-share rights." He describes them as smarting under the injuries they had formerly received from the State, jealous of their power, despising her authority, distrustful of her policy, taking advantage of her indecision respecting their lands, "many also being willing to hazard everything rather than trust to the honor, faith, and generosity of the State," and urges the importance of establishing military post at Tioga. The correspondence which has been preserved between the leading men in the half-share interest discloses the same facts. They believed their titles to their lands to be founded on justice and right, and every measure designed by the government to dispossess them was met with an uncompromising hostility. It was like the old conflict, renewed with all the bitterness of former years, between Yankee and Pennamite. The half-share men were resolute, daring fellows. Many of them had come here with the express understanding that they might expect to fight for their lands, but they were without a leader. Franklin was yet in prison, Colonel Jenkins was surveying lands in the State of New York, no good had come from the capture of Pickering, but the breach had been widened between the old settlers and the new. Many determined to leave the State, and sought homes in central and western New York, which the narrow policy of Pennsylvania peopled with the hardy yeomanry who would have made her deserted valleys to blossom as a garden. Bibliographic data for your source citations: Craft, The Reverend David; 1770-1878 History of Bradford County, Pennsylvania with Illustrations and Biographical Sketches of Some of its Prominient Men and Pioneers, originally published 1878 by L. H. Everts & Co., Philadelphia, Reprint edition published by Tri-Counties Genelaolgy & History by Joyce M. Tice (rootsweb.com/~srgp/jmtindex.htm) 1999-2004.